Content copyright and handling of personal data on the Matsuyama University official website. Personal data refers to information pertaining to individuals, such as name, date of birth, address, e-mail address, password, website access record details, any other details including numbers and codes given to individuals, other identifying codes given to individuals (including information which cannot be used singularly to identify an individual but can be used in conjunction with other information for identification purposes). The Matsuyama University official site attaches optimum importance to user privacy. We work hard to manage and protect user personal data. When collecting data within the bounds of the activities of Matsuyama University, the aims of the data collection are clarified and data collected is limited to what is necessary to achieve those aims. Collected personal data is only used to the extent which is necessary for Matsuyama University activities. 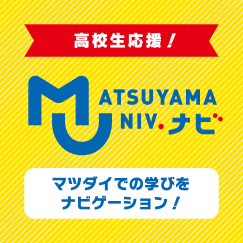 The Matsuyama University official site works hard to guarantee system security with regard to subscriber personal data. Matsuyama University will take no responsibility should the Matsuyama University official website be illegally accessed by a third party, except if this is done deliberately by the University or due to serious negligence on the part of the University. If Matsuyama University determines that a user has caused unjust harm to a third party, the relevant third party and the police may be given information provided by the user, and access records such as ID registration content, registration profile, IP address etc. Furthermore, Matsuyama University may disclose information provided by a user and ID registration content and registered profiles if requested by a court, the Public Prosecutor, the police, the bar association, the consumer affairs bureau or any other bodies subject to their authority. Data may also be disclosed in order to protect Matsuyama University rights and assets.